For a larger branch, I leave then tied until the fall. That seems to do it. For a smaller branch, I will check it in the summer and see how it is staying. Wow Dave, that is the first time I can remember seeing most of your orcahrd. It is beautiful! Just perfect. I also didn’t know there was that much (almost) flat land in all of West Virginia! ha. (I love the state, so that is in no way a shot against it). I’m curious about that tree on the left in the very front…did some kind of critter eat the bark off it, or have you painted it to prevent sun damage or is something else going on? Again, just a beautiful orchard! Thanks. Those raspberries fell to the ground and became a tangled mess last year. I wasn’t able to spray Spinosad for SWD like I wanted to because of the congestion. Still got a lot of good berries though. I made another trellis (looks the same) for black raspberries, which I haven’t planted yet. A man with a plan. Well done. Thanks Kevin. I appreciate that. Eastern WV is the prettiest part of the state. It has large tall mountains and ridges with narrow and wide open valley bottoms. Southern WV is tough terrain. Its mostly erosional landscapes with steep slopes and narrow valley bottoms. It gets easily flooded. Northern WV where I live is generally large rolling hills with wide open vally bottoms. Its not as mountainous as the eastern part of the state. As for the trees, ive whitewashed them numerous times with 50% interior latex paint. Not sure than it helps anything but what you see there is paint that has worn off. For reference that is my Nadia tree. No blooms again this year. The only blooms on it is from a Toka branch I grafted to it. I went to graduate school at UK in Lexington and we made a lot of trips to west virgina for recreation. I’ve floated the New River and the Gauley River both 2-3 times. I’ve been to the famous New River Gorge bridge many times, though never on Bridge day which I’d love to do. I’ve never seen base jumping in person but it looks fun (and scary!) Most of all, I’ve skied at Winterplace many, many times including when I was an undergrad at University of TN Knoxville, which isn’t THAT far from there. In short, every memory I have of WV is wonderful, but everywhere I’ve seen is extremely steep/mountainous. But from what you’ve just described I guess that is because I haven’t been to the right parts of the state. But yea, its a very beautiful place. @thecityman Very cool. The Upper Gauley is a beast in the fall and unrivaled by any stream east of the Mississippi. The lower New is cool too with its long wave train rapids and awesome view of the bridge. Bridge day is kinda cool but has really become over commercialized over the years. It is a specticle to see people jumping off that thing. Been to Winterplace to ski before as well. Its fun but there are certainly better resorts in WV if you want to ski. Snowshoe is fantastic if you ever get the urge to go back skiing. I sold my skis last year. My back and knees dont tolerate it well now the older I get. Glad youve enjoyed your time visting WV. Much to my disappointment I woke up this morning to light frost on my trucks windshield. Outside temp reads 37. Most blossoms are at their most delicate point right now. Hopefully some survive. 37 should be fine for most fruit blossoms. I know this is uber-geek but I’ve created a yard map in GIS. The tree type shown is the original tree which in most cases have later been grafted. The varieties listed are not complete. Those are from the top of my head. I’d need to do a walk through and verify tags in order to complete the list. But this is a start. Circle size relates to relative tree size. Pretty cool Dave, I thought you showed pictures with wooded areas around the outer parts of your yard. Looks like only a couple big trees in your neighbors. You must get lots of sunshine. Was hoping it would grow big and pretty since its known for showy blooms. Unfortunately the aerial is not that great. Its deceiving. I need to refly with the drone. All of that light colored area to the south is a wooded area. The area just west of my trees is a treeline separating my property from the neighbor. Mostly black cherry and sugar maple trees. Photo was taken during leaf off. Ill update it once everything leafs out. EDIT. 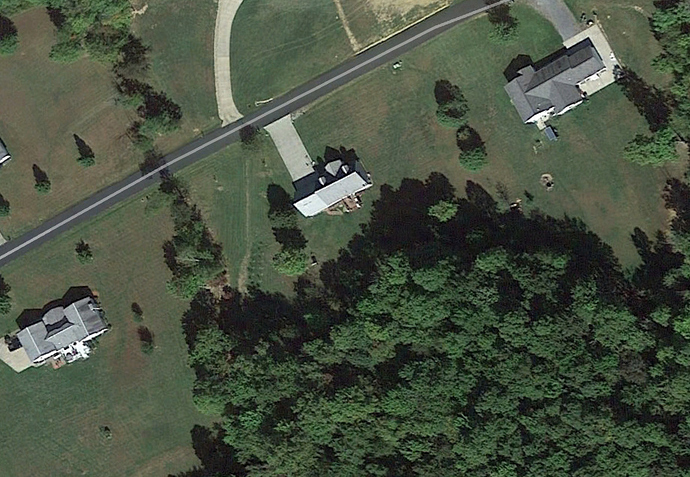 This image from google gives a little better idea of the wooded area behind the house. The small orchard is shaded in early morning but by 9am is in full sun almost all day long up through approximately 8pm in summer. The large tree east of the orchard is a sugar maple and the trees next to the garage and main street are black gum. The two large trees between my house and the east neighbor are unfortunately Bradford Pears Not mine of course. You have a beautiful orchard. Red Baron is a particular favorite of mine. 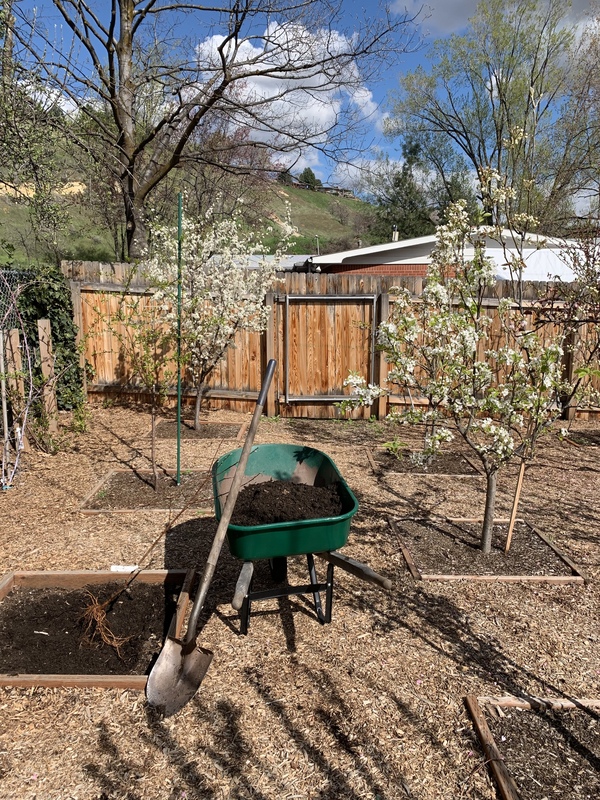 Planted 5 more trees today. 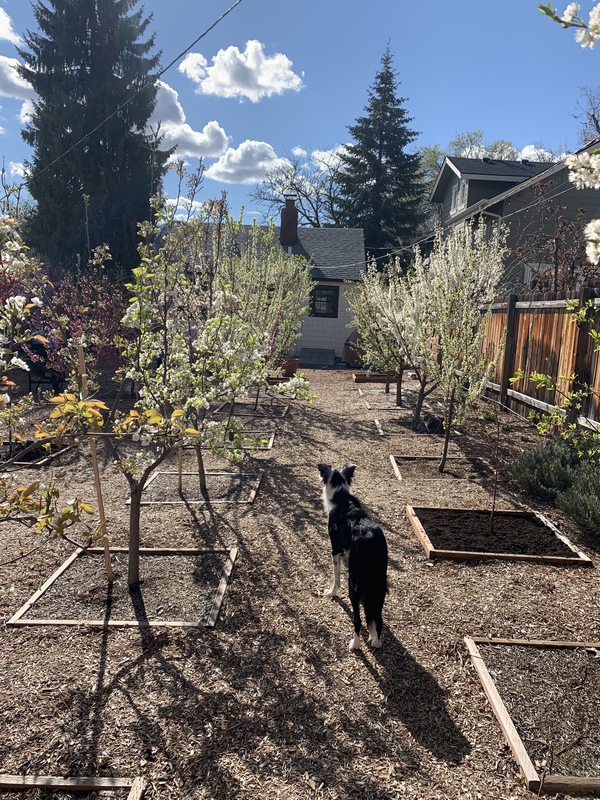 Took a couple pictures while I was finishing up the planting.